It is strange enough that Odo and Eleanor have stumbled upon a sword in a dried-up river outside their village. It is even stranger that Odo is able to remove it from where it's buried. And it's REMARKABLY strange when the sword starts to talk. Odo and Eleanor have unearthed Biter, a famous fighter from earlier times. By finding Biter, Odo instantly becomes a knight -- a role he is exquisitely unsuited for. Eleanor, however, would make a PERFECT knight -- but she's not the one with the sword. 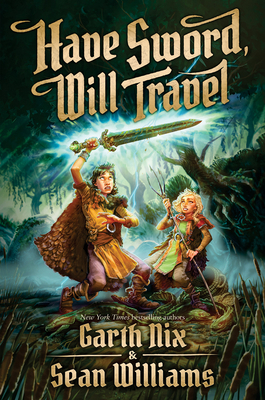 Finding Biter is only the start -- boy, girl, and sword must soon go on a quest to save their kingdom from threats in both human and dragon form, in this new fantasy triumph from Garth Nix and Sean Williams. New York Times bestselling author Sean Williams lives in Adelaide, South Australia. He is the author of over sixty published short stories and twenty-two novels, and has written several novels in the Star Wars universe.